The Council of Heritage Organizations in Ottawa presents the Emerging Cultural Professionals Conference (ECPC), a one day bilingual conference for post-secondary students and young adults who are interested in pursuing and advancing a career in the culture and heritage sector. ECPC will take place on Saturday March 21, from 9:00 AM until 5:30 PM at Ottawa City Hall. The conference includes a keynote speaker and educational workshops focused on strategies for gaining employment in the heritage and culture sector. Topics such as fundraising, event planning, job searching, continuing education, and strategic volunteering will be covered. The Cultural Circuit and the wine & cheese social will provide a great opportunity for one-on-one networking with Ottawa’s cultural and heritage professionals. Learn from their experiences and get insider tips on finding, creating, and applying for your dream job. Download Schedule Here Register now! One Space Left! Register now! Learn the best way to display historic costumes, considering the condition of the artifact, safety, accurate representation of the period, fabrication methods, and preventive conservation. The hands-on component of the workshop includes the construction of a mannequin torso and experimentation with materials and methods for finishing touches. Who can register: This event is open to all. There is a limit of 30 registrants. to explore practical lessons learned from museums that have been involved in storage upgrade or reorganization projects of different scales. On February 9, 2015, the OMA met with the Honourable Michael Coteau, Minister of Tourism, Culture and Sport, to discuss the place and contribution of Ontario museums in our province and to continue strengthening a constructive relationship with the Ontario government. 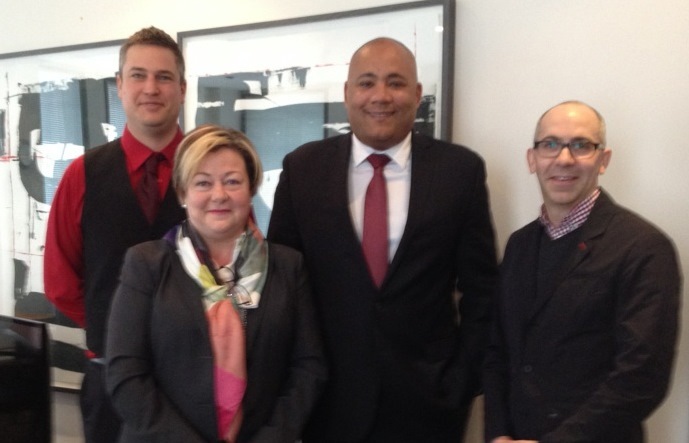 President Yves Théoret, Vice President Clark Bernat, together with Executive Director Marie Lalonde were pleased to have the opportunity to brief Minister Coteau on the economic, cultural and educational impact of OMA members and the museum sector in general and our goals going forward. Noting that Ontario’s museums are part of the province’s $22 billion cultural GDP, employing over 10,000 Ontarians, Yves also stressed the role of our institutions on our collective social and cultural identity. 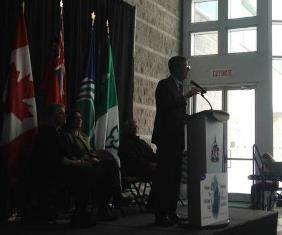 Clark spoke about how integral museums are to each region's tourism assets, pointing to his own experience in Niagara. Marie reinforced the initiatives museums are undertaking to reflect the diversity of Ontario, helping to understand the contemporary issues we all face. The OMA delegation shared the broad preliminary themes emerging through Looking Ahead, the initiative designed to allow our sector to develop informed, relevant strategies to guide our future. 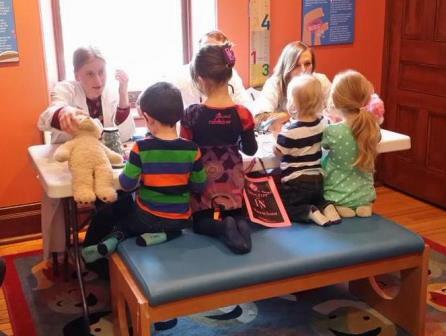 The Looking Ahead inititative is funded through a grant from the Culture Development Fund. Noting that a key objective of Looking Ahead is to improve sector capacity, and strengthen the museum sector’s constructive relationship with the Ontario government, the OMA stressed the importance of adequate, stable resources going forward. The delegation expressed an interest in working with the Ontario government to recalibrate the resource relationship, ensuring a resource framework that meets the needs of museums and the Ontario government. This message was also delivered by the OMA to the Standing Committee on Finance and Economic Affairs and Finance Minister Charles Sousa’s pre-budget consultations in January. Minister Coteau appreciated the opportunity to meet with the museum sector and contribution of our members. He made clear the challenges facing the Ontario government, but all parties committed to continuing to work together. The OMA thanks Minister Coteau for the opportunity to meet with him. We look forward to a long and fruitful dialogue. The Ontario Museum Association was in Ottawa at the Sugar Shack at Muséoparc Vanier Museopark on February 16th, highlighting the 400th Anniversary of French Presence in Ontario. The Honourable Madeleine Meilleur, MPP for Ottawa-Vanier, Attorney General and Minister Responsible for Francophone Affairs was present. Arrow sash workshop. From left, Marie Lalonde, OMA Executive Director, Hélène Boulay, Museoparc Vanier, The Hon. 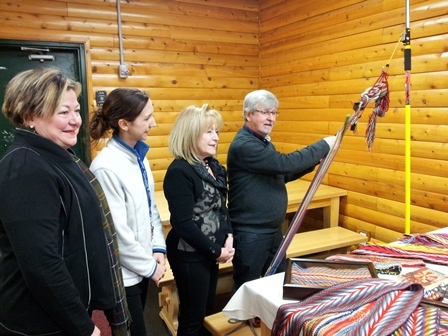 Madeleine Meilleur, Minister of Francophone Affairs, master arrow sash weaver Jean-Maurice Côté, in Sugar Shack at Museoparc Vanier Museopark. Call for Proposals: This year, in the dynamic border city of Windsor, Ontario, the conference will focus on the theme of Re-Defining Borders. Borders can define us. Whether geo-political, cultural, or institutional, whether real or imagined, borders delineate where we start and where we end. But who gets to draw those lines and what do they really mean for museums and the work that we do? It’s time to talk about the borders that contain us: those that we stay within and those that we dare to cross. As always, proposals are welcome for sessions that address the theme and that explore new and exciting ideas, keeping in mind the breadth and depth of the cultural sector. Please submit your proposal online via Survey Monkey. Ontario museums continue to seize the opportunity to build a strong, stable, united and relevant museum community for Ontarians! 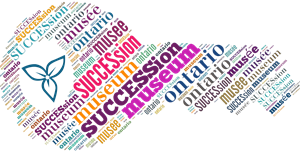 As part of this opportunity, museums from across Ontario have submitted their institutional profile surveys; we want to congratulate these museums who are contributing to the building of a comprehensive and accurate picture of the Ontario museum sector. To show our thanks for the completion of the institutional profile survey we’ve done even more draws from completed survey submissions! It’s not too late! The OMA will continue to accept institutional profile surveys to ensure we have a comprehensive representation of Ontario’s vast museum sector. If you have any questions, didn’t receive a survey, or would like to submit a survey please call OMA staff, Joshua Lichty toll-free in Ontario: 1-866-662-8672 or 416-348-8672 or by email. The Ontario Museum Association commemorates 400 years of French presence in Ontario. Contribute to the Virtual Collection of the 400th! The OMA wants your museum, your collections, and your activities to be included in our 400th anniversary project. 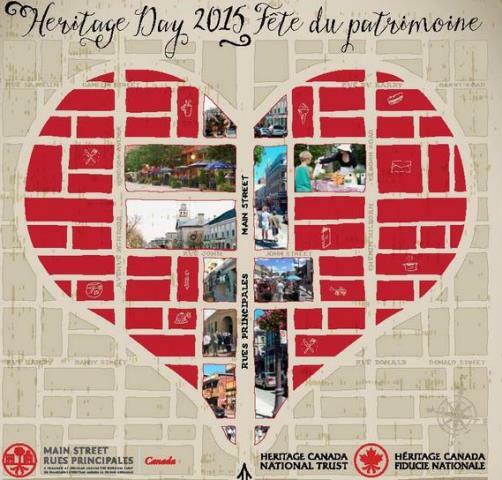 Don’t miss this opportunity to celebrate francophone heritage in your community! We have updated our public website to include a special tab for all your activities, exhibitions, lectures, and workshops related to the commemoration of 400 years of French presence in Ontario. Update your listing on museumsontario.ca by identifying the Ontario 400 campaign to be included in the Ontario 400 section. To add events to the What’s On calendar, and to upload featured photos of related artifacts in YOUR collections to the Ontario 400 campaign, log in to http://members.museumsontario.ca/member-login today to bring us – and the public – up to speed. Want to reach more francophone audiences? The OMA can help! Contact the OMA: Toll free in Ontario at: 1-866-662-8672 o 416-348-8672. L’Assocation des musées de l’Ontario commémore 400 ans de présence française en Ontario. Contribuez à la Collection virtuelle du 400e ! L’AMO souhaite inclure votre musée, vos collections, et vos activités dans notre projet célébrant le 400e anniversaire. Pour ne pas manquer cette occasion de faire rayonner le patrimoine franco-ontarien, agissez maintenant ! Nous avons ajouté un onglet « Ontario 400 » sur notre site public afin que vous puissiez y ajouter toutes les activités, expositions, conférences, et ateliers relatifs aux commémorations du 400e anniversaire de présence française en Ontario. Afin d’insérer vos programmes sous la rubrique Au calendrier, et de télécharger des images d’objets de VOS collections dans l’onglet Ontario 400, connectez-vous dès aujourd’hui au http://members.museumsontario.ca/member-login afin de nous en informer et surtout, d’annoncer vos activités au public. Connectez-vous dès aujourd’hui au http://members.museumsontario.ca/member-login afin de nous en informer et surtout, d’annoncer vos activités au public. Vous avez oublié comment faire pour ajouter du contenu ? Ce n’est pas grave, on a ce qu’il faut pour vous rafraîchir la mémoire. Heritage Day is a nationwide celebration that encourages all Canadians to explore their local heritage, to get involved with stewardship and advocacy groups, and to visit museums, archives, and places of architectural significance. Hundreds of communities recognize that the heritage of downtown is an asset that attracts new residents, invites tourists, and stimulates new investment - the foundation for a vibrant economy and a sustainable future. Canada: Day 1 officially opened at Markham Museum’s Winterfest celebrations on Family Day, February 16, 2015. 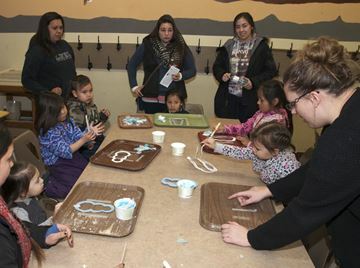 Along with winter-themed activities including snowshoeing and ice-block building, visitors were encouraged to explore Canada: Day 1 and imagine themselves as a newcomer to Canada. The immigration experience is marked by firsts. The first day in a new country takes shape with an individual’s first steps, first impressions and first experiences. Come explore immigrants’ diverse personal Day 1 experiences, from Confederation to present day. Newcomers’ unique and shared experiences—across time and cultures—are highlighted in a thoughtful way through oral histories, archival images, original artworks, objects and your participation. Explore Day 1 through the themes of Transitions, Arrival, Encounters, Finding Your Way and Reflections. You will be transported back to your first day in Canada, or inspired to imagine yourself in a newcomer’s shoes. Visit the bilingual exhibition Canada: Day 1 until June 7, 2015 at Markham Museum. Heritage Week is an opportunity to celebrate our heritage. Through this year’s theme – Play. Endure. Inspire. Ontario’s Sport Heritage – we can explore Ontario’s rich and robust sport heritage. 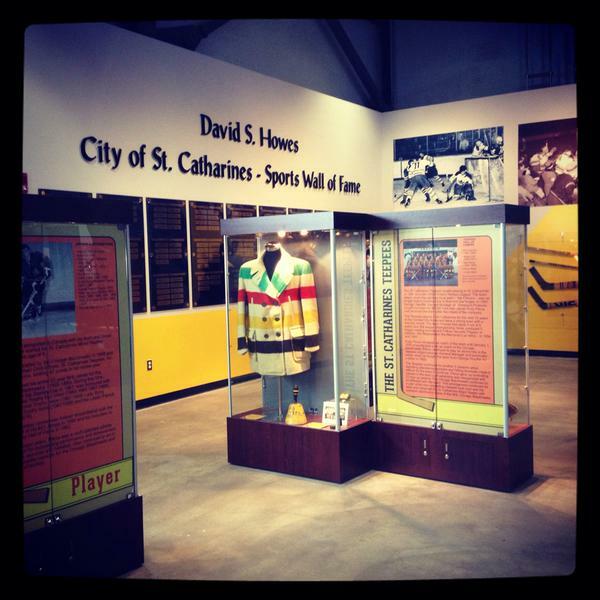 The St. Catharines Sports Hall of Fame was founded in 1990 as a small exhibit at the St. Catharines Museum and Welland Canals Centre, the Sports Hall of Fame then expanded to the Seymour-Hannah Sports and Entertainment Centre in 2012. Sponsored by Fallsview Casino Resort, the Sports Hall of Fame says it recognizes the outstanding accomplishments of both women and men, athletes and builders whom have significantly contributed to the development of sport in St. Catharines and who have gone on to success at provincial, national, and international levels of competition. The Sports Hall of Fame found it's now permanent residence in the Meridian Centre in October 2014. Mayor Walter Sendzik said the Meridian Centre is a great location for the hall as residents and visitors will be able to view and appreciate some of the greatest accomplishments in St. Catharines’ rich sports history. This opening exhibition focuses on the city’s hockey history and features memorabilia relating to some of St. Catharines’ hockey greats, including Gerry Cheevers, Stan Mikita and Brian Bellows. Are you an Institutional Member? Visit the Member Portal to update your museum's listing, add events, programs and exhibitions. For more job postings, check out the OMA job board. You are receiving this email because you are a registered member of the Ontario Museum Association. The newsletter helps fulfill our mandate to provide a communication network for the Ontario museums and heritage sites within our membership. However, we are required by law to offer our email recipients an opportunity to unsubscribe.